Tian Zhuangzhuang is perhaps the best known of [the Fifth Generation] for reviving and revitalizing a staple of the Chinese film industry — the “national minority” genre. Made to celebrate the solidarity of the Chinese people under the Communist regime, these films, often made by studios based in the minority areas themselves, showcased the songs, dances, customs, and patriotism of the non-Han community. Stories of liberation, they usually contrast the “backwardness” of traditional life before the Revolution with the benefits of Chinese Communist rule. 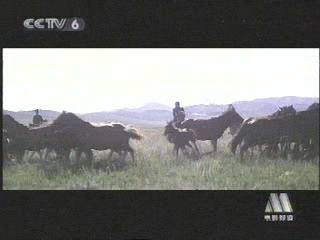 Tian’s On the Hunting Ground, made in Inner Mongolia, and Horse Thief, set in Tibet, fall within the rough parameters of this genre. However, Tian’s work marks a radical break with the aesthetics of earlier generations of Chinese filmmakers. 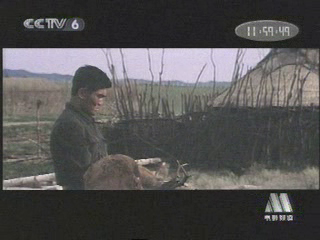 Rather than placing minority peoples within a narrative of liberation accessible to the average Han Chinese viewer, Tian, in On the Hunting Ground, for example, emphasizes the relationship between the land and the people. Long shots and long takes dominate; the landscape overpowers any identification with individual characters; dialogue, which is minimal, goes untranslated; rituals and social relationships remain unexplained. The Mongolian steppes — exotic, violent, harsh, and picturesque — become the visual embodiment of an unfathomable part of the Chinese nation, a marker of the limits of an ethnic identity.